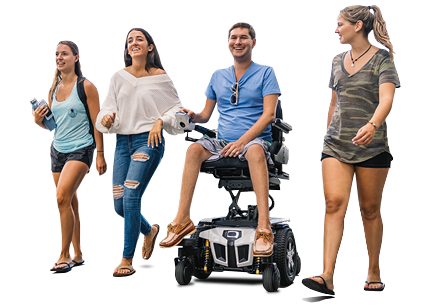 "My 4Front power wheelchair turns on a dime in a crowded train, and the height means I’m eye-to-eye with my fellow commuters, rather than looking at bottoms and bellies." 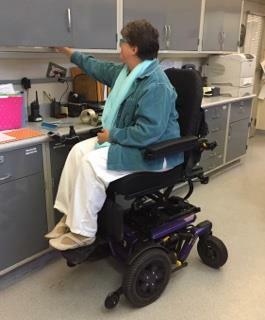 With the elevated seating on her 4Front® power wheelchair, Carol Conway maintains her independence in her job at a veterinary clinic. As Carol Conway knows, when you work at a vet’s office, there’s no slowing down. Carol loves that her 4Front® motorized wheelchair and its safe seat elevation help her to do her job successfully. Carol resides in the San Francisco Bay area in California. She has muscular dystrophy and started working at a busy veterinary clinic 10 years ago when she was still walking. 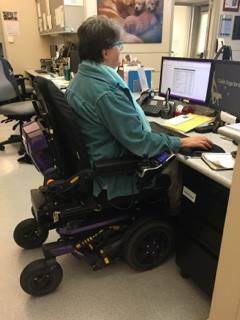 When she began using a power wheelchair full-time two years ago, Carol often had to ask for help at work. Carol commutes to work by train. In good weather, she travels in her electric wheelchair from her house to the train station with no problem. “My 4Front power wheelchair turns on a dime in a crowded train, and the height means I’m eye-to-eye with my fellow commuters, rather than looking at bottoms and bellies,” Carol said. Carol also works at a non-profit organization that trains guide dogs to help people with disabilities. “My power wheelchair is both sturdy and comfortable and is essential to my quality of life,” Carol said.